Housed on a quite back street in the busy Kyobashi area, Fukamachi is a small tempura restaurant that i really enjoyed all the time. 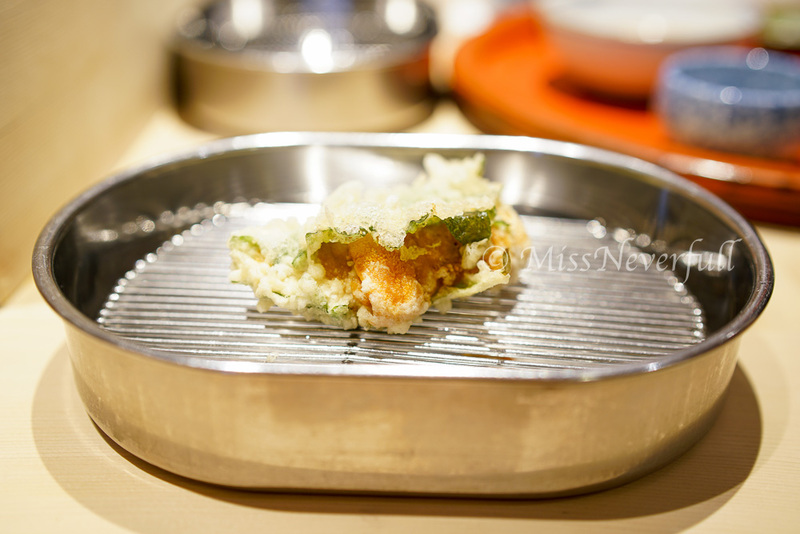 It is also one of the local's favorite destination to settle tempura cravings. Currently running by the chef-owner and his son, Fukamachi has been awarded one star by Michelin Guide Tokyo for continuous years. Last time i had dinner at Fukamachi but this time i tried lunch. We arrived at 12pm and the counter was almost full. The chef-owner Fukamachi-san and his assistant (his son) bowed and greeted us with a warm smile. 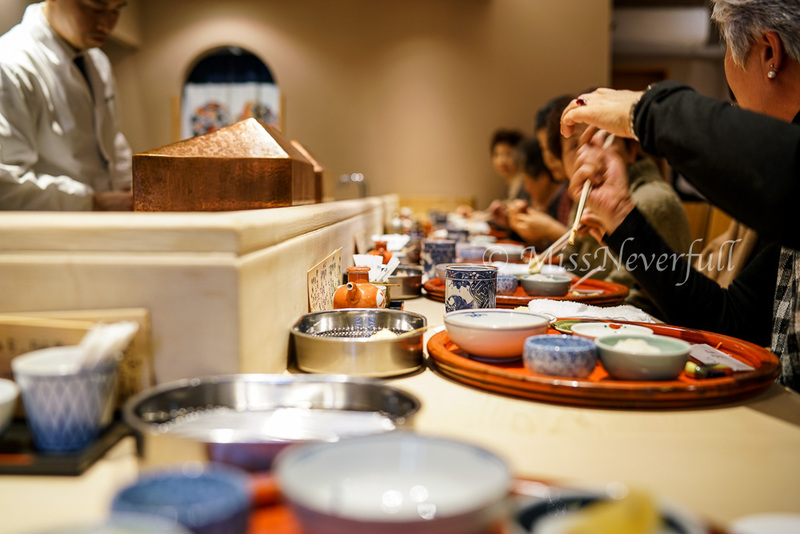 You may choose from 4 different menus: Te-Don (JPY 2,800), omakase with plain rice (JPY 7,000), omakase with small ten-don or ten-cha (JPY 9,000), and vegetable tempura omakase (7,000) which inceludes 2 prawns, 10 vegetables, white rice with pickles and dessert. For the 7k and 9k omakase, there are 2 prawns, 3 fish, 5 vegetables, dessert included in the set, the only difference is the rice part - 7k is white rice, 9k you can choose from ten-don (unagi tempura with sweet soy sauce over rice) or ten-cha (scallop tempura over rice with green tea). On the table: grated radish, empty bowl for left overs, tempura sauce, lemon and sea salt. Fukamachi offers my favorite ten-cha, that's a main part of reason i revisited there. Thus both of us picked the 9k menu. The prawn's head was very crispy and aromatic. Loved the tense umami flavor of the head as well as the body part served right after. The prawn body has a tender inside. Fukamachi uses the best sesame oil, and the chef changes oil every 5-10 minutes. As i mentioned about the amazing skills of Tetsuya-san of Mikawa, who only uses flour for battering, cooked with only one pot and one hand. Here at Fukamachi, the son assists the father battering with flour and eggs. I have hear Fukamachi-san is pretty good at vegetable tempura. Yeah, the gingko nuts has very thin battering, the nuts were still very fresh and chewy. A must-try at Fukamachi, also my favorite tempura ever - uni (sea urchin). This is not included in the set and you have to order it seperately. The fresh uni was wrapped inside the shisho leaf, deep-fried but still raw in the center. It was quite large in size, much bigger than 2*Kondo and any other uni tempura i have had oversea. 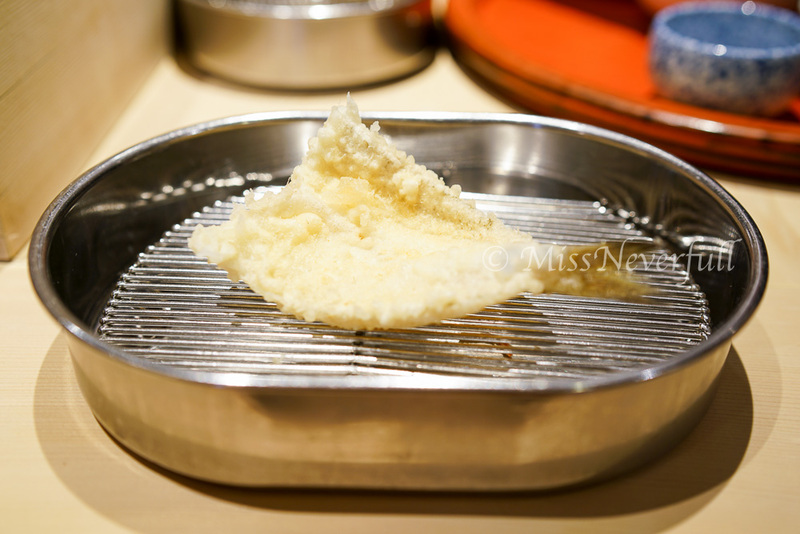 Inside the crispy skin was a burst of creamy and umami flavor of the uni, with a sweet aftertaste. Wonderful. The mushroom was unexpectedly juicy and aromatic, very impressive. The lotus root was smooth and delicious as well. Asparagus was large in size and wonderfully cooked, the battering was incredibly thin and the inside was still green and fresh. Although Tetsuya-san of Mikawa is much more famous for his legendary Unagi tempura, i prefer Fukamachi for its lighter taste, the flesh was moist and umami. For the main dish part, i had the regular ten-don for my last visit, it was rice topped with mixed seafood tempura. While this time was unagi tempura over rice served with sweet soy sauce. I was not drooling at all when chef Fukamachi-san was preparing other guests' ten-don, because i am looking forward to my dearly ten-cha. The best part of Fukamachi's tencha is the 'cha' (tea base), not bitter nor strong in tea flavor, yet very aromatic and perfectly matches the tempura. It was perfect to eat after i take a picture because the tea has already absorbeed all the oceanic flavors of the scallop tempura. 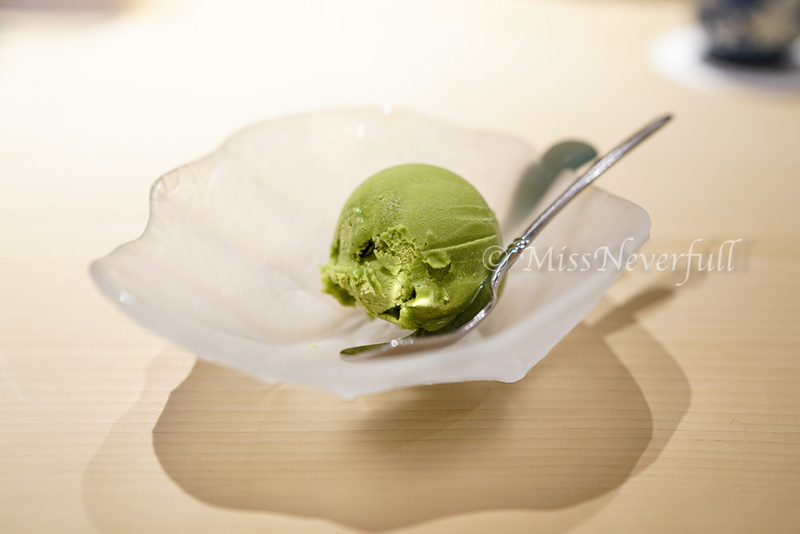 Matcha ice-cream was served at the end. Very tense and lovely matcha flavor, the bitterness was great for cleansing the palate. Nicely wrapped up a satisfying meal.